What does a white diamond painted on the road mean? What does a white diamond painted on the road mean? Correct. Many, but not all, pedestrian crossings will have a diamond painted on the road just before them. Why are white diamonds painted on the road? A white diamond painted on the road means you are approaching a pedestrian crossing. The crossing in the photo below is on Franklin Road in Auckland. The trees obscure motorists' view of pedestrians waiting and can also create shadows meaning the crossing is more difficult to see. 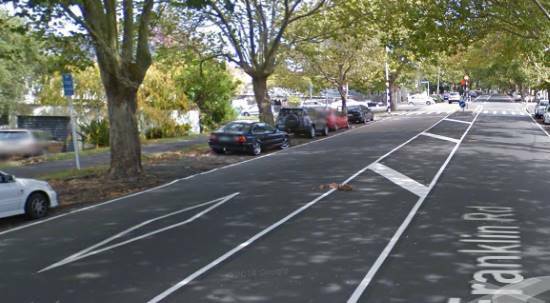 A high grip road surface is sometimes laid before crossings on hills or near schools such as at this crossing on Howe Street, Auckland.